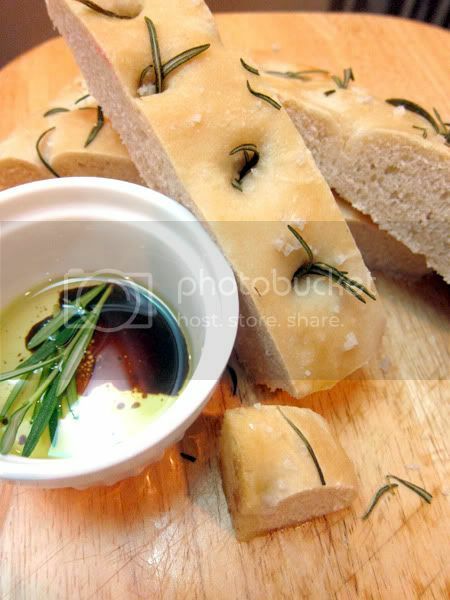 Focaccia is popular Italian flat bread, often time, topped with fresh herbs, olives and sometimes with meat, vegetables and cheese. It may sound like a pizza but it’s not. 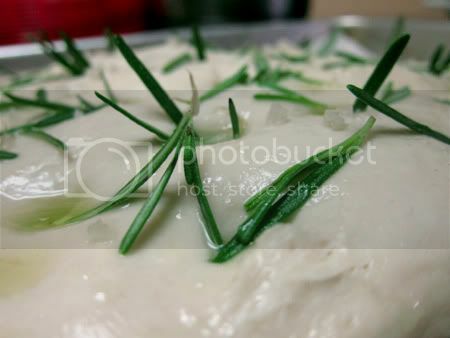 Focaccia doughs are similar in style and texture to pizza doughs, consisting of high-gluten flour, oil, water, salt and yeast. It is typically rolled out or pressed by hand into a thick layer of dough and then baked in a stone-bottom or hearth oven. Bakers often puncture the bread with a knife to relieve bubbling on the surface of the bread. Also common is the practice of dotting the bread. This creates multiple wells in the bread by using a finger or the handle of a utensil to poke the unbaked dough. As a way to preserve moisture in the bread, olive oil is then spread over the dough, by hand or with a pastry brush prior to rising and baking. I’m not a bread person, but Focaccia is one of the few artisan breads that I like. I made focaccia once in LCB a couple of years back and have never made it again. It was lovely to dip them in balsamic vinegar, even better if it’s caramelized for the deep sweet and sour flavour. Mix flour, yeast and salt together in a large mixing bowl. 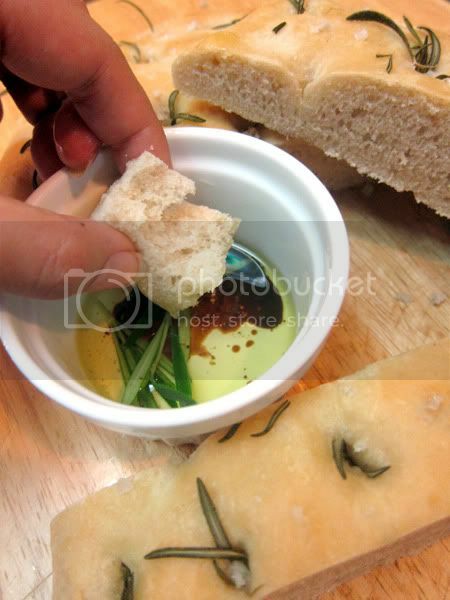 Stir in the water and olive oil and mix thoroughly until the dough comes away cleanly from the side of the bowl. Tip the dough out on to a lightly floured work surface and knead until smooth and springy (about 10 minutes). Oil a bowl and put in the dough. Cover with a damp cloth and set asaid in a warm place to rise for 1 hour. When the dough has almost doubled in volume, tip it on to a baking pan, slightly greased, and spread it into a thick slab with your fingertips. Cover with a damp cloth and set aside for further 30 minutes. Meanwhile, preheat oven to 230 C. Place a roasting tin half full of hot water in the bottom of the oven. To fill the oven with steam, give the tin a little shake as the bread goes in to bake. The steam will stop the crusts on the loaves cracking. When the dough has risen again, make little pits all over the surface with your fingertips. Brush the top with thinned honey and press in rosemary, press in olives if you like. Drizzle the loaf with olive oil and sprinkle over sea salt crystals. As soon as the loaf goes in the oven, turn the temperature down to 220 C and bake for 25-30 minutes. dipped in olive oil, balsamic vinegar and rosemary. Oh yes I love this!!!! I tried making this once, but had a hard time finishing it cos I sprinkled too much salt , too salty leh. So threw away half the bread. Looks so pretty with the rosemary! Bookmark this, i like savoury way of bread.. It looks pretty but I wonder how my kids will react when they see this. They are not used in this kind of food.